With summer now well and truly upon us, it’s the perfect time of year to fling open your doors and windows, and make your garden a proper part of your home. 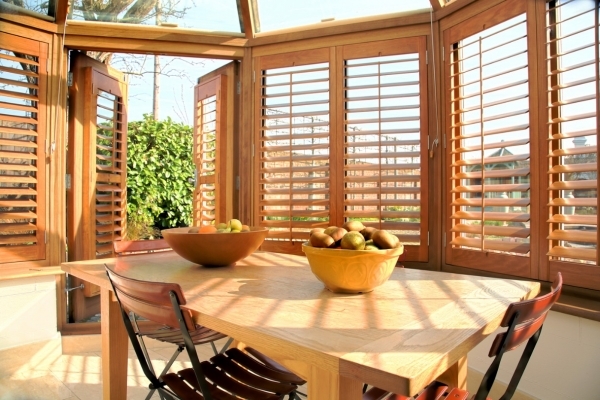 Acting as a link between the outside and inside areas of our homes, wooden shutters – especially in a natural finish, evoking the flora of the outside – allow light and ventilation in whilst also offering maximum privacy, perfect for when you’re lingering outside all afternoon. Using shutters throughout the home is great way to gain maximum exposure to the light, especially on summer nights when the nights are that little bit longer. By pairing wooden shutters with light-coloured furnishings and natural finishes, not only will your room feel brighter and more airy, you’ll also be making your home feel a lot more spacious.